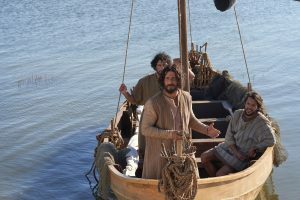 A new streaming television series about Jesus’ life is being produced by VidAngel. Surprisingly, this is the very first TV series ever made about the life of Christ. Many movies and miniseries have been created over the years, but no multiple-season show has been attempted before. The show’s 23-minute pilot, available to view for free at http://bit.ly/TheChosenPilot, has been viewed 15 million times in 10 languages. It’s even been seen on satellite TV in Iran. Plans are for The Chosen to last seven seasons, with eight episodes each season. The first four episodes of The Chosen were shot in fall 2018, and the next four are currently in production. The complete, eight-episode first season will be on VidAngel in November 2019. There will be an early, pre-sale opportunity to purchase and watch the first four episodes this Easter. Jenkins is working with VidAngel rather than Hollywood to preserve the show’s biblical integrity. “I’ve been making movies for some of the biggest studios in Hollywood for 20 years. But this shouldn’t be entrusted to Hollywood. It needs to be made by us,” he said. Nicodemus gives a lecture to rabbinical students. Photo courtesy The Chosen. Besides conducting extensive research, the show relies on a panel of advisers from the faith community, including Rabbi Jason Sobel, a popular figure with Christians and co-author of the best-selling book with Kathy Lee Gifford The Rock, the Road, and the Rabbi; New Testament scholar Doug Huffman from Biola University; and the highly respected Father David Guffey of Family Theater Productions. “The number one goal of the show — the reason that it exists — is to make Jesus known,” Jenkins shared. But The Chosen takes a nontraditional approach. It reveals Him through how He changed lives. 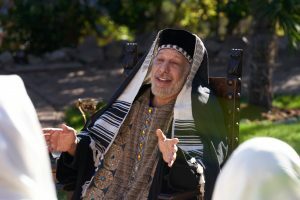 “I think part of the thing that’s unique about this series,” said Rabbi Sobel “is that with so many of the traditional biblical Jesus films and content that’s created, the focus is on Jesus, but here a lot of the focus is about how the lives of the people who encounter Him are transformed. It really does a lot with character development. It makes the characters very real, very engaging. “In one episode you see Jesus laughing with children, and there is something very powerful about that. Yes, He’s God made manifest in the flesh, but He’s also a real person who really cares and has real relationships and cares about those relationships with people. When you look at who He chose as His disciples, you have these individuals who are far from ideal, far from perfect, far from being saints, and we see in the early episodes how they have these real struggles. Jesus teaches a group of children in Episode 3. Photo courtesy The Chosen. Jesus speaks to a crowd of people from Simon and Andrew’s boat. Photo courtesy The Chosen. Cunningham also described how they determined Peter’s house would look. “Some biblical scholars and historians have quite a few articles about Capernaum,” he said. “They have the footprint of Peter’s house. He actually had a pretty big house, which was surprising. And we modeled a little part of his house for the main living area of the set for Peter’s home because in the next few episodes is where they’re going to be having church. So we wanted to make the house big enough so down the road we could fit a lot of people in there. So we modeled his house around the real house of Peter. People can look it up online. And they show the floor plan of it. All that’s left basically is the base of the house but it was all done in basalt rock. Quintus, the Roman leader of the region, leads men to confront Nicodemus as he arrives at Capernaum. Photo courtesy The Chosen. “I think one of our biggest obstacles was just trying to acquire all that stuff with a small budget. We used a lot of stuff over and over again,” he explained. “Then there’s a lot of the miracles — like the miracle of the fish was a huge challenge. At first we going to use real fish, but then we found out we couldn’t because of restrictions with animals and then we ended up having to do CGI [Computer Generated Imagery] for it. Simon and Andrew cast their nets after a fruitless night of fishing. Photo courtesy The Chosen. Cunningham hires experts to create the items they need for filming. They’re truly tops in their field. Costume designer Paméla Incardona, for example, has a master’s degree in costume design and has been working in the industry for 22 years. She spent weeks researching designs and fabrics, but found that there really isn’t as much certainty about clothing from that period as one might expect, simply because relatively little has survived the centuries. “Pottery can be verified. Bone. Things that lasted through time, but fabric doesn’t last,” she said. Incardona has faced other challenges as well. Challenges that the average viewer wouldn’t even think about. To create an effective scene, for instance, there must be variety in the colors and textures of fabrics among the actors. So she had to carefully plan that by assigning different color palettes to each of the principal actors. Incardona also had to take into consideration the various economic levels of the characters, so tunics had to be different lengths. The common people wore shorter tunics because more fabric cost more money. And the costume colors are limited by the dyes available at the time, such as pomegranate. To simulate wear, she washed cloth repeatedly, sanded it, and frayed it. Because of the tight production schedule and the fact that she was the only costume designer — and for most of the time, the only seamstress as well — she was under constant time pressure, often working 18 hours or more per day. “It was running and gunning throughout the entire show,” she said. In spite of the incredible pressures and demands of shooting on a deadline, it’s a labor of love for the crew because they know the eternal purpose behind it. 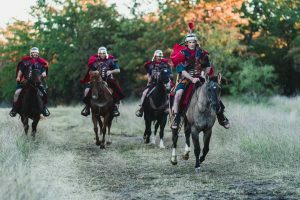 “If we can help the audience encounter Jesus through the eyes of those who actually met Him, the audience can perhaps be impacted in the same way that they were,” Jenkins said. “The light of the silver screen is one of the key ways to be a light to the world,” Rabbi Sobel commented. Follow The Chosen on Facebook, Twitter, Pinterest, and Instagram. Get behind-the-scenes information, interviews, and videos about the show’s production at http://bit.ly/TheChosenUpdates. VidAngel (www.vidangel.com) is a subscription-based, $9.99 per month TV filtering service that allows users to mute or skip objectionable content from network-produced shows and movies distributed through streaming devices. In addition, a division of the company, VidAngel Studios, produces original content such as clean comedy. VidAngel was inspired by the vision behind The Chosen and enthusiastically took on the project. But without Hollywood’s huge budgets, it had to do fundraising to underwrite the enormous expenses involved in bringing a show to the air. The Chosen has seen tremendous success in finding support, becoming the No. 1 crowdfunded media project in history. “I think doing this as a crowdfunding enterprise by people who truly believe in it is the way to go. So we need finances, we need prayer,” Jenkins said. “We just hope that people will watch the pilot episode and spread it and share it to continue the impact.” The show is funded by everyday people investing in the production with a minimum $100 investment. Round 1 of fundraising brought in over $11 million from more than 15,000 people. For more information, visit the website and FAQ page.